So just to prove that I’m a masochist and that the Dodger Editor is not dead (even though I don’t think that anyone has been using it) I thought I’d post a quick update. No the editor is not dead and no neither am I.
I’m still writing for Python Magazine and working on the editor in some of the free time that I get. I just added a selection cursor mode to the editor which makes it easier for me to use. You can see it in the second row of the pallet in the following screen shot. Now with a Select Mode! If anyone is at all interested in this project, whether it’s using or helping to develop, or just some suggestions please let me know. I’m always open to opinions. 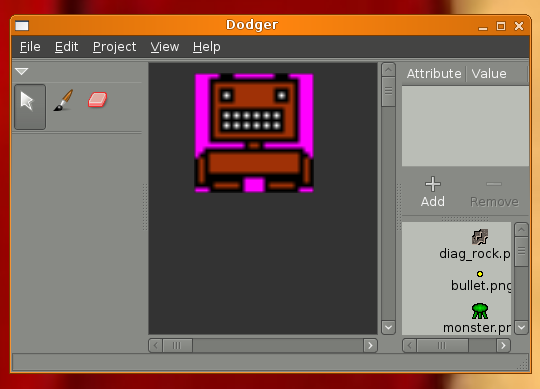 If I get the time I’d like to work on a short post showing you how you can use the Dodger Editor to create the level files for a game, when that will be I don’t know but hopefully soon. 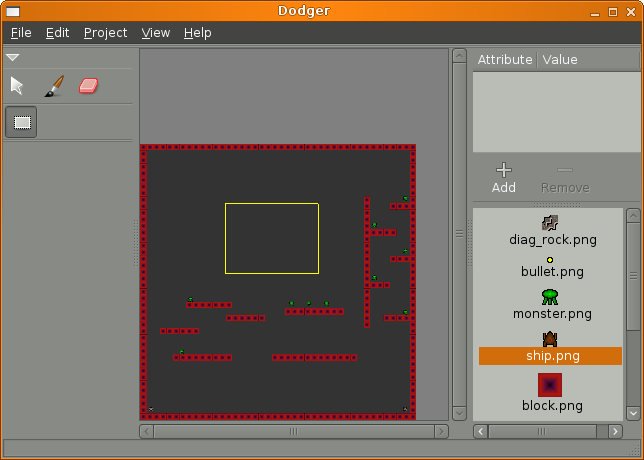 So here it is the initial release of the Dodger Editor. You can download the source from the google code page. Originally I wanted to wait longer to release the first version, but as time went on and it kept taking longer and longer I realized that if I didn’t release the first version at some point in time I might never release it. If I had gotten done everything that I wanted to get done then I would be releasing the full first version of the project instead of this incredibly alpha release. So if something doesn’t work don’t be surprised. That being said you should be able to use it for it’s basic functionality. Or at least that’s what I’m hoping. For now any changes that you make or fixes will have to be emailed as a patch but eventually I want to make it much much easier for people to submit fixes. If you are really interested in contributing to this project let me know via a comment to this post and or an email. Then once all of the source issue are setup we can start working together. For general usage information please read the README file or General Information page on the google site. It’s pretty rough right now but hopefully over time we’ll be able to work on it. A Simple Python Game Engine? 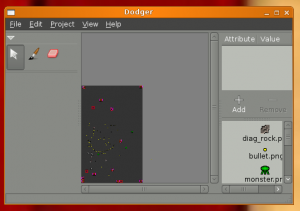 If you do decide to use or test dodger remember that you are going to find a lot of bugs during the iteration. Please be kind and report the issue.